Cathy Bessant, chief operations and technology officer at Bank of America and a member of the company’s executive management team, is the 2018 recipient of the UNC Charlotte Distinguished Service Award. She was honored Monday, May 7, during a special luncheon in the Popp Martin Student Union. 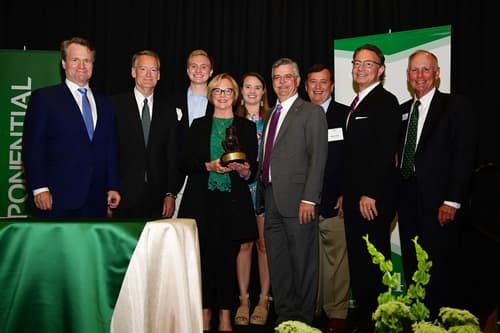 "UNC Charlotte is proud to honor Cathy Bessant, a woman who truly epitomizes the term 'distinguished service,' as our 2018 Distinguished Service Award recipient," said Chancellor Philip L. Dubois. "She has served in exemplary fashion in a number of ways through her work with one of the largest employers in our state as well as through her personal involvement with a number of community organizations and institutions, including UNC Charlotte." Since 2010, Bessant has led Global Technology and Operations for Bank of America and delivered end-to-end technology and operating services across the company through nearly 95,000 employees and contractors in more than 35 countries. Active in her community and region, Bessant chairs the North Tryon Vision Plan Advisory Committee, a public planning initiative to develop and establish a vision to catalyze and sustain growth and development in the North Tryon area of Uptown Charlotte. She has served as chair of the Foundation for the Carolinas and has worked tirelessly to support Charlotte-Mecklenburg Schools, especially through the CMS Involvement Group, which studied models of philanthropic involvement in public education that have proven successful in other communities. Bessant also is a board member for North Carolina’s Council for Commerce, Business and Industry. Bessant received the Order of the Long Leaf Pine for her civic and business contributions to the state of North Carolina and the Women in Business Lifetime Achievement Award from the Charlotte Business Journal. Her service to UNC Charlotte includes serving as a trustee and chair of the Board of Trustees Committee on Audit, Compliance and Risk Management. Bessant also has been a strong advocate for women’s athletics and chaired the University’s “Let Me Play” campaign, supporting the role of athletic participation in the development of young women. The Distinguished Service Award, established in 1987 by the Board of Trustees of UNC Charlotte and the Board of Directors of the University Foundation, honors those who have provided outstanding leadership and exemplary service to the Charlotte community and to the advancement of UNC Charlotte. Each recipient of the award receives a statue of a gold miner, cast from a sculpture by Lorenzo Ghiglieri.